Lecture by Dan Estabrook, 2013 Frances Niederer Artist-in-Residence Thursday, April 18, 6 pm • Frances J. Niederer Auditorium,Visual Arts Center Tanja Softić: Migrant Universe was organized by the Halsey Institute of Contemporary Art, College of Charleston School of the Arts. Left: Tanja Softić, Second Angel (detail), 2008. Acrylic, pigment, charcoal and chalk on handmade paper mounted on board. Courtesy of the artist. Right: Dan Estabrook, The Clown (detail), 2012. Gum bichromate with watercolor and gouache. Courtesy of the artist. CONTRIBUTORS Brian Counihan Olchar E. Lindsann Emily and Chelsea wearing papier-mâché heads made by Brian Counihan for the Marginal Arts Festival. We’re so excited to offer our readers this special edition of VIA Noke, created in partnership with the Marginal Arts Festival. 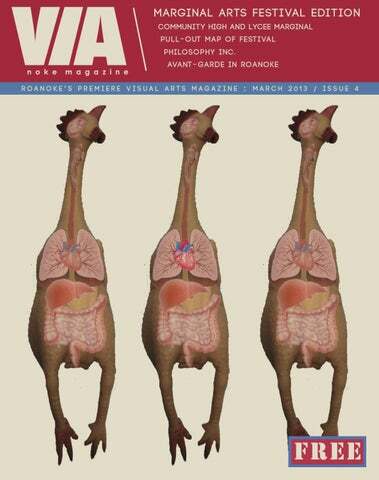 This issue is dedicated to everything Marginal Arts and will serve as the festival’s program and guide. Marginal is defined* as something that is “relegated to the fringes, out of the mainstream; made to seem unimportant.” Marginal Arts Festival does not seek to define the term “Marginal” but rather aspires to provide a space in the margins - between institutions - for artists who would prefer to build a community through their art than restrict their creativity merely to find acceptance in the local art mainstream. Each year, since its inception in 2008, the avant-garde community, performance artists, and artists of all sorts embrace the “free space” between defined art forms and proudly (and literally) parade their marginality as undefined, critically engaging, often absurd, unrestricted fun. Everyone should be very proud to live in a city that encourages these grassroots movements and happenings, which make so many different forms of creativity available to everyone here. Even better, all of the MAF’s educational workshops, lectures, performances, and other activities are available to everyone, and with the exception of a couple, completely free of charge. Do not miss out on the opportunity to partake and participate. 20 . . . Philosophy Inc.
12 . . . Avant-Garde in Roanoke? selected from an open call in the window’s La-De-Da Clothing Boutique in downtown Roanoke. The hats will each represent one of the nine circles of hell in Dante’s Inferno: Limbo, Lust, Gluttony, Greed, Anger, Heresy, Violence, Fraud and Treachery. The hats will also be featured in the Marginal Arts Festival Parade on Saturday March 30. Visiting international performance artists, such as the performance duo, Zierle and Carter, and Rebecca Weeks (who travelled from England specifically for this festival last year) have come in to Community High School courses for question and answer sessions and presentations. This opportunity to connect with artists in a classroom environment was one of the things that inspired student enthusiasm for the festival. Last year, my classmates and I, under the mentorship of Rebecca Weeks from Cornwall, did several performance art pieces around downtown Roanoke. My group’s piece involved handing out blank sheets of paper to passersby and asking them to come to a “very important event” that was apparently and invisibly being advertised on the paper. This year’s Marginal Arts Festival will include a whole week of artist-lead workshops, lectures and master-classes in preparation for the three-day festival. I will be leading on the role of the audience in performance art. I believe I speak for all of the students at Community High School when I say that the Marginal Arts Festival is a wonderful opportunity for us and the citizens of Roanoke to see and participate in art that challenges us intellectually and lets us sample the wider world. Star City Shadow School is working with Community High School to produce a series of workshops, classes and lectures presented by local and visiting artists and collaborators. In the lead up to the Marginal Arts Festival, from Monday March 25th – 27th, students of Community High School and area residents will be offered a plethora of DIY and independently sourced classes. Community High School campus, 302 Campbell Avenue SE, 16 West Marketplace, and other venues will be utilized to host these classes, integrating them into this year’s festival content. Many artists who’ve developed strong ties with the festival and the local creative community will be offering classes linked directly to their practice and the work they’re bringing to this year’s festival. We’re very excited about the experimental writing, music and performance workshops we’re presenting this year. Ohio poets John M. Bennett and C. Mehrl Bennett, who’ve been MAF participants and supporters since its inception, will be hosting a hands on workshop called Collaborative Poetry Writing and Performance. Local historian, organizer and teacher Olchar E.
The Worldâ&#x20AC;&#x2122;s Most Perfectly formed Midget Wrestler ! With Brian SIEVEKING! informal conversations, collective research projects, storytelling, guided tours, and other forms of sharing between Roanokers and visiting MAF participants. These activities touch on everything from cooking to poetics to local history to ethics: anything that somebody wants to share with their extended communities. Quiet Active Meditation: Drawing for Stress and Pain Relief/Management! With Bill BEAMER ! Improvisation in Post Cagean Music! With Reed ALTEMUS! AVA N T - G A R D E The mere idea behind this concept can be approached from an infinite range of possibilities, for this reason it is important for the scope to be narrowed into a few generalized notions. It is also important that a definition (for avant-garde) is set into place so that one may realize that the argument is using a specific set of boundaries. The National Gallery of Art defines avant-garde as, “A group or work that is innovative or inventive on one or more levels: subject, medium, technique, style, or relationship to context.” Though it may seem a tad bit naïve, one must explore the actual existence of avant-garde anywhere in relation to present time. Simply put, does avant-garde exist? Through studying history on such subjects there is documentation that it has existed in the recent past, for with every new movement there has been the presence of innovation. The dispute occurs when new art is challenged as to the innovative qualities of the work. In short, is there any work being produced today that meets the definition of avant-garde? This question should also contain a future clause; if avant-garde does not exist in the present, can it in the future? If one were to assume that all art is created and equally that all art is perceived, can it be assumed that a percentage of these works are innovative? It seems plausible that most artists would argue that there is a percentage of art that is truly cutting edge. Though, can it also be assumed that a number of these artists are subjecting their response to their individual sense of pride? Print by Roanoke-based artist Jim Leftwich and John M. Bennett. Leftwich first made imprints by spray-painting stencils and then sent the print to Bennett, who added the calligraphy and letter stamps. its culture. Even though it is not a necessity for the community to be avant-garde, it does help for the community to not be complacent. When facing this complacency, it is difficult for artists to breach the walls surrounding the art community. This drives some artists to other communities, enabling those communities to thrive while the community left behind becomes stagnant. This stagnant community is a difficult place for avant-garde to exist because the community becomes less excepting of new ideas, making those with new ideas frustrated. Truthfully, avant-garde can exist in Roanoke, but only because it can exist anywhere. In the state that Roanoke is in at the present, it may be difficult for avant-garde to be recognized. If a piece of art is not noticed can it still be considered avant-garde? This question is something for you to ponder while considering that it is all of our responsibility to change our community. That by embracing our unique culture while being educated by others could allow for a true growth. Over the years, the Marginal Arts Festival has become a key event in a network of international avant-garde communities, and a home-away-from-home for Mail Artists, Fluxists, Post-NeoAbsurdists, and Noise musicians from all over the US and beyond. During the MAF this ‘Eternal Network’ converges on Roanoke to celebrate and share their connections with each other, and to share and explore connections with our local creative family here in the valley, using performances, workshops, collaborative activities, and conversation to create new forms of relationship and interaction between local and international communities. Buchholz is an American artist, located in St. Louis, Missouri, specializing in Intermedia and Fluxus. A native of Illinois, he began showing work in the region in 1978. Over the years, works have included large scale Installations, documentation, audio, video, artists books, and mail art networking. Keith is a member of The International Union of Mail Artists, Fluxnexus, The Chicago Fluxus Ensemble, FLUXUS / WEST, and The International Fiber Collaborative. He has shown work in projects in over forty countries in the past year, and was recently chosen as one of thirty American artists to show their work at the Kennedy Center in Washington D.C. as a voice for global warming. Leftwich, an innovative and dynamic poet from Charlottesville, Virginia, founded and edited the influential avant-garde literary journals Juxta and Juxta Electronic, with co-editor Ken Harris, in 1994. During the 1990’s he was intensely active as a correspondent, theorist, and critical writer in the area of avant-garde poetry and writing, and was an influential figure in the development of ideas and consciousness for the new literary culture he was involved with. He was also influential in the promotion and distribution of the work of many of his fellow poets and writers. He himself has produced a significant body of literary work, work which is textual, conceptual and/or visual. His autobiography was published in 1996 in vol. 25 of Contemporary Authors Autobiography Series. Keith currently operates Fluxus/St. Louis as a home base and studio, and an outpost connecting St. Louis to the world Fluxus network. He additionally collaborates on ongoing fluxus and mail art projects worldwide, and is the curator/publisher of Fluxkit Quarterly, an editioned fluxus publication archived by over twenty museums worldwide including The Getty Museum Archive, MOCA Chicago, Pedersen Archive (Copenhagen), St. Louis Art Museum, University of Iowa / Special Fluxus Collections, Museum Fluxus + (Potsdam), University of Ohio Special Collections, and the Tate Archive (London). From 2000 to 2005 he edited the journal Xtant, and since 2005 he has edited the poetry and mail art blog, textimagepoem. He is the author of Doubt, The Textasifsuch, Sample Example, Trashpo, Pulsing Swarms & Squiggly Diagonals, and Death Text. Visit marginalar tsfestival.com for more info. M AR KE T ST .
MA RK E T ST .
Maybe you’ve heard her captivating voice on This American Life or as Violet in the movie The Incredibles. Or read one of her best-selling books about American history. Or seen her on The Daily Show with Jon Stewart. Come hear the multitalented Sarah Vowell in person and be amused and informed by her distinctive voice and perspective. For more spring events at Hollins, visit www.hollins.edu/events. We’re local, and proud of it!!! The Be Blank Consort has been performing experimental poetry since 2001. The members of the consort write many poems collaboratively and employ chance and visual techniques along with traditional poetic practices to create improvisational or open performance scores. Membership in the consort fluctuates depending largely on the location of specific performances and the availability of performers of sound poetry at a particular time and place. Performing in past MAF’s have been regular members John M. Bennett, K.S. Ernst, Sheila E. Murphy, Michael Peters, and Scott Helmes, along with members of the Post-Neo Absurdist Anti-Collective. C. Mehrl Bennett C. Mehrl Bennett married John M. Bennett in 1980 and has 2.5 sons who’re into improvisational sound and/or instrumental music. She is an artist working digitally, with found objects, traditional materials, mailart, fluxus performance scores, visual poetry, artistamps, and collaborates well with others. C. Mehrl Bennett has presented visual poetry, digital art, artist stamps, and/or collaborations via PowerPoint in Uruguay, Mexico City, and in Roanoke. She’s a frequent performer and collaborator at Fluxus Festivals throughout the nation. See C’s books and other books she’s helped facilitate at www.lulu.com/lunabisonteprods and read her blog at cmehrlbennett.wordpress.com. Top print by Sheila Murphy and John M. Bennett. Bottom print by Bela Grimm, Olchar Lindsann, and Jim Leftwich. Photos by Jim Leftwich. p h i lo s o p h y i n c .
Philosophy Inc. creates an enthusiastic and friendly motivating impetus to learn more about the city that we live in. When asked about Roanoke’s art community, Ames responded by saying, “normal people get just as excited about art as artists do.” Through the videos, photography and other various projects of Philosophy Inc., he claims that Roanokers are able to look at their town from a variety of perspectives. Philosophy Inc.’s most recent project of restoring the S.W. Virginia Commodore Inn sign is a perfect example of what the organization stands for: remembering Roanoke’s past: and taking note of what it is today. The sign holds value for him because it stood over the bar where his grandfather would go to get a drink after work, and was located just around the corner from where Ames grew up. Acknowledging signs from places that cultivate a regional, social culture, such as the Commodore, is important for Roanoke as a whole he claims . Ames calls the sign, “a beautiful piece of history that is worth preserving.” One of Philosophy Inc.’s earliest involvements with the Marginal Arts Festival was its exhibit at the Taubman Museum of Art, Philosophy Inc. Probes Roanoke (2011). This exhibit featured maps of Roanoke created by local artists and a “Most Boring Photographs of Roanoke” contest. Philosophy Inc.’s involvement in the 2013 Marginal Arts Festival will take place in the Boxley building, on Jefferson Street. For a time, rooms in that building will serve as Philosophy Inc.’s very own office and the headquarters for a collaborative research project. This will include an accumulation of photos and observations circling around Roanoke, Virginia. Stop by and visit Matt from March 25 -29 and participate in his research project, or check out his other projects and videos on his website, www.philosophyinc.com. Some who read this, perhaps newcomers to the Valley’s alternative arts scene, or those who remain steadfastly at the perimeters of the arts community, peering occasionally at newspaper event notices, maybe with a curious eye or a dismissive head shake, probably wonder just what the “marginal arts” might be and of what possible relevance? inhabitants and community sites are encountered in new and surprising ways outside of and apart from their usual context. During my doctoral research, I interviewed a number of local artists and cultural leaders. Several younger artists credited the MAF with helping shape a Roanoke arts climate where “new things are happening every day” so there is a “fearlessness to make things happen.” The cultivation of an experimental arts “scene” has broader significance. Economic development practitioners increasingly recognize the importance of networks for incubating ideas and businesses. The MAF has nurtured a sense of “scenius”, a term originating from electronic music pioneer/producer Brian Eno. Scenius Research indicates that such strategies may refers to a sort of communal inspiration that drives also have adverse impacts, including increased culture forward, and it is present wherever inequalities, funding disparities, and socio- fertile and fluid ‘scenes’ pop up in a community. economic exclusion. Roanoke, too, has expe- These scenes may involve artists, developers, rienced these drawbacks, as those who have scholars, activists, and other community leaders who witnessed and winced at the Taubman Museum together constitute an imaginative ecosystem. of Art’s financial struggles and the Arts Council The MAF, and related activities, help keep of the Blue Ridge’s seeming dissolution would alive this imaginative ecosystem that is helping most likely agree. Art, as economic engine, has its redefine Roanoke. limits. The MAF, however, summons some of art’s other functions, such as its ability to illumi- By encouraging and fomenting an ethos of nate these contradictions and to affect individual grassroots innovation and civic self-reflection, the and civic change. In The Aesthetic Dimension, MAF is helping call forth a newer Roanoke, not Herbert Marcuse described this type of in- one dismissive of the past nor one separable from nate and radical potential of art. Art, by taking the many other initiatives and ideas taking place, reality and “re-presenting” it, is “committed to an but one that is willing to question, to explore the emancipation of sensibility, imagination, and edges, to energize the civic imagination. Art is frequently touted and utilized as an economic driver and a source of community identity. Roanoke is no exception to this trend. The Taubman Museum of Art, a $66 million building, is a visible example. So is the City’s $2 million annual investment in arts and culture through public art, festivals and events, and major capital improvements to downtown cultural anchor institutions. Art as a development strategy is clearly one part of Roanoke’s ever evolving identity. The festivities kick off after a hard days work with a walk led by Roanoke’s multi talented thespian Blair Peyton. In his guise as “ghost tour guide” hand assissted by costumed members of “Team Rose,” Blair will lead a tour of the nights MAF opening while indicating the many defunkt art entities (galleries, studios, theaters, and organizations) that have gone under over the past few years. Expect photographers, and fun interaction with performers along the way. Look for sugar skulls if you decide to take the tour at your own pace. Write your own eulogy or dirge to a favorite crative space and present it as we progress. Yes, Roanoke has all sorts of art galleries opening, but lets take a moment to reflect on those we have lost! Curated by Team Rose and sponsored by Plantagenet Rose. 16 Church Avenue SW Stop by for refreshments at our comfy (but temporary) festival home, and view the products of a week of workshops, demonstrations, lectures and straight out art pounding! Collaborative drawing, Silkscreen printing, Big head decorating and more and more and…..
La De Da Window, 102 Church Street Seven deadly sins? Seven sinewy, seductive, sequiny or silky hats that push boundaries, will be dragged up from the depths of Dante’s Inferno and find their place to perch on models and manequin’s heads for the week of the festival. Want a piece of the action? Dream up your own Inferno nightmare and submit it quick! Deadline is the first week of March! www.marginalarts.com for details. Curated by Frank Finch. 26 Church Avenue SW Max Mead Mitchell is a PAFA & Penn graduate and Community High alumnus. This new space is full of potential. Stop by and hatch some new ideas with the new guy in town! 108 Market Street (In the old Gallery 108 Space) For over a century wrestling has been an active, if not always appreciated, force in American popular culture. From circus sideshows to sold out civic centers, VFW halls to the airwaves of multi-billion dollar entertainment conglomerates wrestling’s tights enwrapped titans have grappled through the public consciousness. As inexpensive and easily recognizable programming it was a foundational staple of early television, local and independent channels through the sixties and early seventies, the cable explosion of the eighties, and the satellite and web based entertainment stream of the twenty first century. At once soap opera and morality play, its larger than life personalities provided the blueprint for reality TV. For decades wrestling has been an integral part of the lives of people ranging from young boys to retired grandmothers. Unknown to many however, is the major role it has played in the rise of sports as national obsession, the changing definition of national attitudes and character, and even the desegregation of the Deep South. Wrestling with Art presents drawings, paintings, sculpture and video; an array of artists, artifacts, and disciplines that celebrate and investigate this often neglected aspect of national culture. Curated by Brian Sieveking. 418 Jefferson Street (Boxley Building) Curated by Matt Ames. Read an article about Ames and Philosophy Inc. by Celine Anderson on page 20. Last years sensational home of installation art, performance art and whatever that other stuff is called! This group of young and hungry artists make Roanoke look – well like somewhere worth visiting for an art scene! Curated by Amanda Agricola and Mateo Marquez. Mysterious and unconfirmed location; check website for details. LIMINAL alternative artspace, 302 East Campbell Ave SE A circus inspired group exhibition of art from national and regional artists along with vintage circus ephemera. Including works by Edward del Rosario, Lori Field, Rob Tarbell, Jack McCaslin, John Reburn, Ursula Dilly and others. Opening night performance by Tif Robinette. Curated by Susan Jamison. The movie is introduced: Carnival Of Souls. A shiver runs through the crowds, as fear settles in. The speech continues, light jokes are made and the film begins. A hush, even quieter, falls over the audience, spellbound by the terrifying images on screen. Tension grows by the second as the viewers, captivated and focused on the story, begin to slip deeper and deeper into the film. With each bump and jolt, the audience, flinches, laughs, and cries, as the thing on screen goes from a movie to a life, which, one after another, people begin to identify and understand. 8pm @ June M. McBroom Theater, Community High This new group collaboration was created just for the Marginal Arts Festival for an “absurdist /surrealist /dadaist in nature” sort of show, featuring Hollins MFA playwrights, local writers, actors, dancers and musicians, plus a onenight-only musical performance by ambient, minimalist, noise project, Gonzo Capote, and much more. Just $10 admission. It’s not just a movie, it’s life. Then the movie ends, and the spell is broken. Some people, done with the movie, go on to something else, the characters, places, situations and emotions gone. Others, still confused and needing an explanation for what happened, why they had been sucked into the film stay after. Ideas and thoughts fly by, as people speak of what they saw. The audience pontificate, agree and disagree. When arguments are heated, and facts and needed, the filmic monitors, armed to the teeth with Carnival of Souls trivia and facts step in. People speak, arguments are settled, ideas are passed around and a film is understood a little bit better. With that, the viewers leave, happy and sated. Curated by Swade Best. The mission of SCCS is to create a co-operative arts community in Roanoke, VA. Our focus will be on promoting Roanoke’s vast talent and creating new environments. Through doing this, we give artists a chance to thrive and become a part of the cultural fabric of this great city. Community driven events are of the highest priority to us. We will strive to better the lives of those who are involved and affected by our efforts. By artists we include all disciplines and are non-judgmental regarding talent. SCCS is all inclusive, aiming to bridge the gaps, and overcome the cliches. By working together we can help each other in marketing, resources, space sharing, word of mouth, and as a strong presence when approaching businesses, museums, and the city. ed. The tentacles were animated by eight dancers adorned in crocheted flourishes resembling coral. The octopus float provided an opportunity for Calling all artists, musicians, danc- collaboration amongst several difers, performers, bicyclist, activist, ferent contributors and talents that absurdist, and anyone else interested ordinarily might not have worked toin creating a public spectacle in the gether, thereby achieving a primary streets of downtown Roanoke! Join us goal of the festival; connecting peoas we all march out of step togeth- ple within our community. The octoer! Once a year this invitation to the pus float also served as early publicity community goes out to announce for the amazing Roanoke Valley Reef that it’s time to get prepared for the exhibition, now on display at Marginal Arts Festival Parade. This Roanoke College. year the event will be on Saturday March 30th at noon. This wacky little art parade has grown since it was added to the Marginal Arts Festival in 2009, and has become an anticipated favorite event of the festival. The first year that it was introduced to the festival, about thirty costumed people participated, and our permit only allowed us to be on the sidewalk. We have since moved into the street, steadily increased in size, and added small floats and big puppets to the procession. A parade ending with the resounding sounds of bubble wrap through the streets of downtown Roanoke, and a piano being smashed to pieces by Fluxus Roanoke were some of the most memorable moments of the first Absurdist Street Carnival. The next year, gospel singers and a chicken Every year there are memorable launching trebuchet were among contributions to the parade. One of the highlights. the greatest highlights of the past parades was the Bread and Puppets collective from Vermont. The third year we were very lucky to have this political theater group march in the parade. They also generously gave workshops and performances during other days of festival. Three years after that first venture Part of the reason for the popularity into the absurd, we are about to emof the parade is that it’s a collabora- bark on this zany adventure again. tive festival event that anyone can This year, the Carnival will take place participate in. Parade organizer, primarily on the Community High Ralph Eaton, invites interested per- School campus and be home to a sons to help out with construction number of activities. There will be of whatever parade art is being flying chickens, deranged stuffed made for this year’s parade, or if that animals, day of the dead face paintdoesn’t fit your style or schedule, all ing, and more crazy and exciting you need to do to participate is just booths for you to visit. show up on parade day with whatever it is that you want to contribute to Belly dancers will abound and music theparade, and be ready to march will be setting the scene for folks to at noon. The parade will assemble at meander through Renaissance fight11am at the Community High School ers, Fortune Tellers and a Folk Singer parking lot, 302 Campbell Ave SE. illustrating her story with Crankies. March 30th We’re working on it. It’ll be weird and glorious. Where else could you and your child graffiti a wall together or Build-AChicken? Walk anonymously as a Lucha Libre after creating your own mask throughout downtown Roanoke, or have your picture taken at the Photo Booth in your new “mod” shirt. Whatever it is that you decide to spend your time investigating at the Absurdist Street Carnival, you will have a wonderful time with your children in ways that you won’t find anywhere else. Vaudeville is not wholly unique to the United States — other countries have their own histories of live variety performance — but it reached a level of broad popularity and deep cultural penetration here that shaped us utterly. At the MAF, we miss Vaudeville’s crass and unabashed hucksterism, its gaudiness, its ingenuity, its capacity for self-mockery, and its sublimely unpretentious admixture of high and lowbrow. When watching Vaudeville, its difficult to understand why your professors were so worked up about postmodernism. Here’s what’s good: Bird Calls, Knife Jugglers, Dog Acts, Ventriloquists and Flash Acts. Here’s what else is good: Bhangra, Modal Jazz, Step Dance, String Quartets. Here’s what’s best: All Mixed Together, Higgeldy-Piggeldy, which is not to say unsequenced. $10 adults, $5 Student. June M. McBroom Theater, Community High School, 302 Campbell Avenue SE. Curated by Josh Chapman. What can you do with an Easter egg? Decorate one any way you choose and bring it by Community High by Wednesday, March 27th. An Easter egg hunt will occur during the MAF’s Absurdist Street Carnival. Our Mission is to foster creative and independent problem solvers with diverse backgrounds and abilities into scientifically and culturally literate, globally conscious, locally engaged citizens.